Men and women have different physical differences which makes bicycle manufacturers make bikes that will accommodate those physical differences. This is a bicycle that is specifically tailored for male riders with various bicycle structures made to suit the male physical characteristics which may include leg to torso ratios. One of the essential properties of a male bicycle is its compactness and a top horizontal bar. This is a bicycle that is made to suit the physical properties of female riders and can easily be identified with its signature physical design of a top bar with a diagonally placed frame. Due to consideration of the fact that women have shorter bodies, especially the torso to leg length, the top tube is lowered to help them mount. Additionally, the top tube is lowered to help women who were skirts while riding to mount and dismount the bicycle with ease. On the other hand, have longer lengths, and their body shape makes it easy for them to use a bicycle with a horizontal top tube. 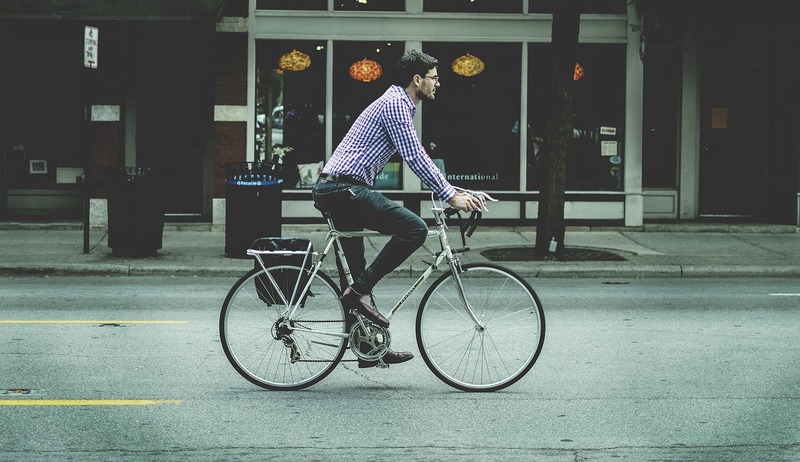 Moreover, men wear trousers or shorts while riding which makes their bicycles to be predominantly feature a horizontal top tube which is relatively high. A bike needs to have a crank length that suits the needs of the owners so that they can easily and comfortably reach the pedals while at the same time maintaining their balance. Because women have shorter torsos concerning their body size, women bikes have shorter cranks so that they can reach them easily. Women bikes have an average crank length of 165 millimeters. Men have significantly longer torsos concerning the proportional size of their bodies which makes the bike manufacturers make bikes with a longer crank. Typical men’s bike comes with a 170-millimeter crank which allows men to reach the pedals and maintain balance. Manufactures develop the women’s bike by increasing the length and angle of the head tube at the front of the bike to prevent overlapping of the toe and the front wheel while pedaling. This makes the front wheel more forward as compared to men bicycles which helps in increasing stability. Besides, the seat tube on women bicycles is at a steeper angle as compared to man’s bicycles which are brought about by the shorter top tube. The seat tube in men bicycles is not at a steep angle because the top tube is horizontal. Typically, men have broad shoulders than women, which makes the handlebars to be wider on a man’s bike so that they can handle them comfortably and have significant control of the bicycle hence preventing toppling. Women have shorter hands and relatively wide hands which makes the handlebars to be narrow and placed a bit lower than on a man’s bike to help them reach them easily and have the control of the bike and help in negotiating corners with ease. Grips in women’s bikes are smaller to help them fit in the small hands of women. Moreover, brake levers on women’s bikes tend to have a shorter reach to accommodate a woman’s smaller hands. On the other hand, the broad shoulders and longer hands of men help them to reach and fit on the relatively large grips on men bikes while the brake levers on men bikes have a longer reach which is a significant difference to accommodate the man’s significantly longer hands. Naturally, women have wider pelvic bones than men. This makes the manufactures to put this physical difference into consideration when manufacturing bikes for the two genders. Apparently, women bicycles have shorter and wider saddles to accommodate the wider pelvic bones. However, men bikes are fitted with longer and narrower saddles. Without putting other factors like bicycle body parts into considerations, the size of women’s bike is significantly smaller due to the smaller stature of women. The small size helps in lowering the center of gravity which increases stability. On the other hand, men bikes are significantly larger with larger body parts to accommodate the large stature of men which helps in riding and controlling the bike. A smaller bike makes men feel tired because it is not proportional to the size of men’s body parts. Men and women bikes have different physical properties to help them to be consistent with the difference in both men and women, which includes; hands, pelvic bones, and length of the legs. The saddles of women bikes are shorter and wider to accommodate the wider pelvic bones while men bikes have longer and narrower saddles. Women bikes have smaller grips and shorter brake levers which can easily be reached by the smaller women hands while grips and brake levers are wider and large to accommodate the wider shoulders in men. Other significant differences between men’s and women’s bikes include the overall size, handlebars, top tube, crank length, Head and Seat Tube Angles among others. Jecinta Morgan. 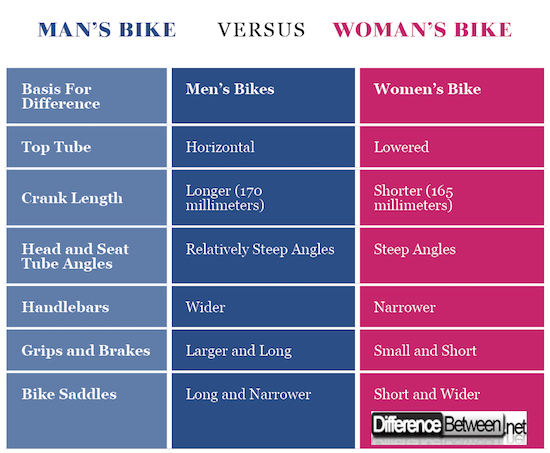 "Difference Between Man Bike and Woman Bike." DifferenceBetween.net. April 2, 2018 < http://www.differencebetween.net/object/difference-between-man-bike-and-woman-bike/ >. Berchicci, L., and W. Hulsink. "Of Bikes and Men: Innovation patterns and strategic entrepreneurship in the human-powered vehicle sector." Strategic Entrepreneurship: The Role of Networking, Vrije Universiteit Amsterdam (2006). Bonham, Jennifer, and Anne Wilson. 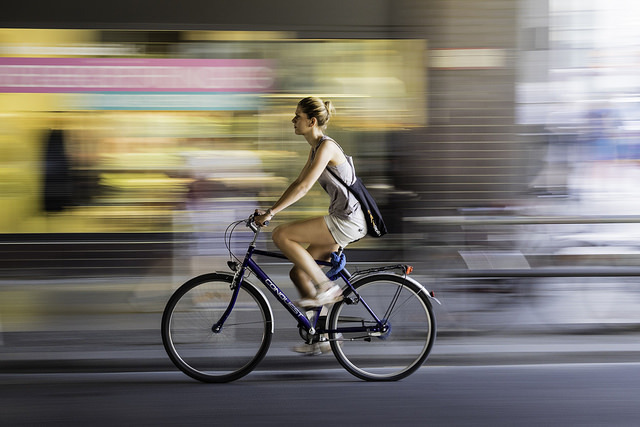 "Bicycling and the life course: The start-stop-start experiences of women cycling." International Journal of Sustainable Transportation 6.4 (2012): 195-213. Bonham, Jennifer, Carol Bacchi, and Thomas Wanner. "Gender and cycling: Gendering cycling subjects and forming bikes, practices, and spaces as gendered objects." University of Adelaide Press, 2015.